The Michigan Arbor Day Alliance is partnering up with Arbor Brewing Company for the month of April to help raise money for tree plantings near wetlands, lakes and rivers. Arbor Brewing is raising money through the sale of their Treebeard IPA and donating to MADA! Trees help naturally filter our water, and we know that clean water = clean beer! So what we’re saying is.. drink more beer to help us plant more trees! This is a statewide initiative and the beer can be purchased at various locations from grocery stores to bars and resturants. Arbor Brewing Company has two locations: Ypsilanti (Corner Brewery), Ann Arbor (Brewpub). The staff at Arbor Brewing pride themselves in being environmentally conscious. They have installed solar panels on the roof of their Corner Brewery location and the Brewpub in Ann Arbor is in the process of working towards composting all waste and having 100% compostable to-go containers, straws, napkins, etc. They should reach their goal in the next couple months. They also support local farmers and hop growers by purchasing local and Michigan-grown ingredients whenever possible, both in brewery production and in their kitchens. For years, Arbor Brewing has been participating in Earth Day Clean-ups, Arbor Day events and supporting the Huron Watershed Council. Every year, they hope to grow and expand their efforts. It is Arbor Brewing’s goal to plant as many trees/shrubs as possible this year near wetlands and rivers to help reduce erosion, stormwater runoff and to clean the water we drink. Click here to learn more about Arbor Brewing Co.
Click here to find a location near you that is selling Treebeard IPA! Arbor Day is right around the corner! Roughly 1,000 second and third graders from the mid-Michigan area are expected to attend our celebration this year! Students will rotate among hands-on natural resources activity stations and spend the entire day outside celebrating Arbor Day. The annual Arbor Day Celebration at Potter Park Zoo is a great opportunity for teachers and their students to participate in a cost free outdoor field trip. Switching it up and having students learn while outdoors is an enriching and fun experience. Each year is a little different, we select a new tree species to be planted during the tree planting ceremony and there are a few different activity stations every year. In addition to planning for Arbor Day, we hold a statewide 5th grade poster contest. The theme for this year’s 5th grade poster contest was “Trees for Bees.” We received 46 fantastic poster entries from all across the state of Michigan. Voting is open on our Facebook Page as well as at MSUFCU Headquarters at 3777 West Rd., East Lansing, MI 48823. Voting closes April 1, 2019. The 1st place winner will be invited to Arbor Day. The 1st, 2nd and 3rd prize winners and their teachers will receive gift cards! If you are wanting to plan your own Arbor Day Celebration this year, visit http://www.miarborday.citymax.com/f/How_to_Hold_an_Arbor_Day_Celebration.pdf to learn more! One of the best times of the year is finally here, tree planting season (AKA Spring)! It’s time to break out your shovel and gloves to give the earth a little tendering loving care. Get growing! There many different tree species to choose from but native trees are best because they are adapted to living in Michigan. Whether you are looking to create wildlife habitat, prevent soil erosion or provide shade in your yard, there is a tree for you! We are encouraging the planting of trees for bees and other pollinators because they rank at the top of the list of important insects, moving pollen from flower to flower to ensure pollination and the resulting production of many of our most important fruits and vegetables. Our supermarket shelves and dining room tables would look dramatically different if not for pollinators — especially bees. But in many areas, parasites, a lack of forage, and other factors are threatening bee health and survival. Trees’ flowers are a critical source of forage for bees, providing nutrient-rich pollen and nectar that bees use for food and to make honey. Not sure where to start? First, read this article on trees that are good to plant for pollinators, then find a local nursery to purchase the trees from! Researchers and naturalists from The Ohio State University and metro parks in northeastern Ohio report on the emerging “beech leaf disease” epidemic, calling for speedy work to find a culprit so that work can begin to stop its spread. The disease has already been found in 11 counties in Ohio, eight Pennsylvania counties and five counties in Ontario, Canada. It’s characterized by dark-green “bands” that appear between the veins of the trees’ leaves and provide the first hint that the tree is diseased. In later stages, leaves become uniformly darker, shrunken, crinkly and leathery. Affected limbs stop forming buds and, over time, the tree dies. Young trees seem to be particularly vulnerable. Scientists can’t be sure what is causing beech leaf disease, but researchers at Ohio State think that the symptoms point to a microbe rather than an insect. If just half of the American beech trees in Ohio were lost, it would come at environmental costs of approximately $225 million, according to an estimate in the new paper (Forest Pathology journal) that takes into account various factors, including the trees’ role in removing carbon from the atmosphere, maintaining biodiversity, furnishing habitat for wildlife, aiding in water purification, providing aesthetic and recreational value as well as other ecosystem services. The threat is significant in Ohio and throughout more than 30 states in the eastern U.S., where beech trees are common and serve as habitats for a variety of animal species and as food for woodland birds and mammals, including squirrels and bears. If Beech leaf disease were to invade Michigan, we could suffer some serious losses. It is evident that this disease has the capability to cause great harm. Tree Planting Grants are now available to Michigan communities! The Michigan Arbor Day Alliance (MADA) is currently offering local units of government, public educational institutions, public libraries, non-profit organizations, neighborhood associations, churches and tribal governments the opportunity to apply for a Michigan Arbor Day Alliance Tree Planting Grant. Grant applicants may request up to $2,000 to fund tree planting projects in their community. Grant funds may only be used to purchase trees. Applicants must show evidence of a 1:1 match for anticipated money. This is a statewide grant opportunity for Michigan projects only. Grant applications are available on the Michigan Arbor Day Alliance’s website. To apply, please go to http://www.miarbordayalliance.org/tree_planting_grant.html to download an application. Applications are due by mail no later than April 30, 2019. Funded plantings must be completed by December 31st, 2019. The Michigan Arbor Day Alliance would like to thank our program sponsors for helping make these programs possible: ITC, Michigan Department of Natural Resources, Lansing Board of Water and Light, Eaton Conservation District, and Michigan State University Federal Credit Union. The Michigan Arbor Day Alliance is a coalition of organizations and agencies dedicated to the promotion and celebration of Arbor Day throughout Michigan. Our dedication comes from our belief in the importance of trees and their role in community health and well-being. Since 1993, MADA has provided educational programs and services to Michigan communities. The Michigan Arbor Day Alliance is a program of the Eaton Conservation District in Charlotte, MI and is made possible through support from the Michigan Department of Natural Resources. Oaks are some of our most beloved trees in the state of Michigan. Why? They reach heights of up to 150 feet tall and provide plenty of shade during our hot summer months. But oaks, especially those in the red oak family, are threatened from a disease known as Oak Wilt (Ceratocystis fagacearum). Oak wilt is an exotic fungus of unknown origin. This disease is caused by the fungus Bretziella fagacearum. It spreads from tree to tree by underground root contact, through tiny, sap-feeding beetles that carry spores from fungal pads on infected trees into wounds on healthy oaks. 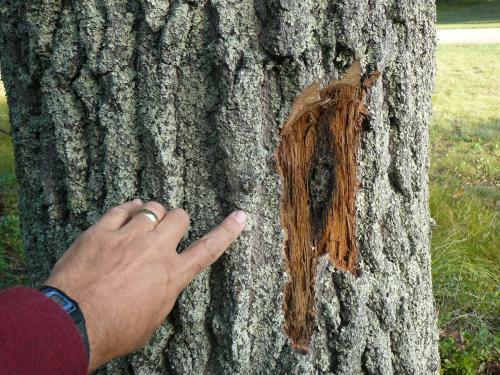 The microscopic spores can infect and kill a red oak within weeks. Spores can be found on recently cut firewood from trees that died of oak wilt. This is one of the reasons why the DNR and other agencies advise against moving firewood. A symptom of oak wilt is the leaves begin to turn brown, with parts of them still green. Once a red oak starts showing symptoms, you cannot save it from dying. On the plus side, simple actions such as refraining from pruning oak trees between April 15 and July 15 and covering accidental bark wounds with paint, can help keep healthy trees from being infected. Oaks in the red oak family, including black oak, northern red oak and northern pin oak, are most susceptible to the disease, which kills trees by interrupting the flow of sap. Trees in the white oak group are less susceptible because they have a different internal cell structure that prevents rapid spread of the infection through the tree. Trees in the white oak group have rounded leaf edges and include white oak and swamp white oak. -Don’t prune oaks from mid-April through the summer. -If oak trees must be pruned or removed during the risk period, or a tree gets damaged, immediately cover wounds with tree-wound paint or latex-based paint. -Don’t move firewood, especially if it comes from oak wilt-killed trees, as it can harbor the fungus. -If firewood is suspected of being tainted by oak wilt, cover it with a plastic tarp all the way to the ground, leaving no openings. This keeps beetles away so they can’t move spores onto healthy trees. Leave wood covered until the fall of the year following tree death to keep the disease from spreading. Department of Natural Resources Forest Health Division: DNR-FRD-Forest-Health@michigan.gov or by phone at 517-284-5895. For more information on oak wilt, click here. There are about a dozen characteristics available to help identify trees. Learning which subset of characteristics to use for a particular tree is where practice and skill are needed. Some characteristics are seasonal, such as leaves, fruits, and flowers. Most others are more year-round, such as twig and branching patterns, buds, bud scars, bark, tree form, site, and tree associates. When all the leaves have all fallen off deciduous trees, you can identify them by examining the bud! You could look at the bark, but it can vary greatly among-st individual trees. Sometimes, if a tree is too tall, accessing the buds is nearly impossible, so other identifying characteristics may be necessary to ID the tree. A good tactic for beginners is learning the ten most common tree species first; sugar maple, red maple, white cedar, red pine, white pine, northern red oak, quaking aspen, bigtooth aspen, black cherry and hemlock. Once these trees are known, comparing them to unknown species will often make the identification process move quicker. In the chart below, there are some common Michigan tree species with pictures of their buds. 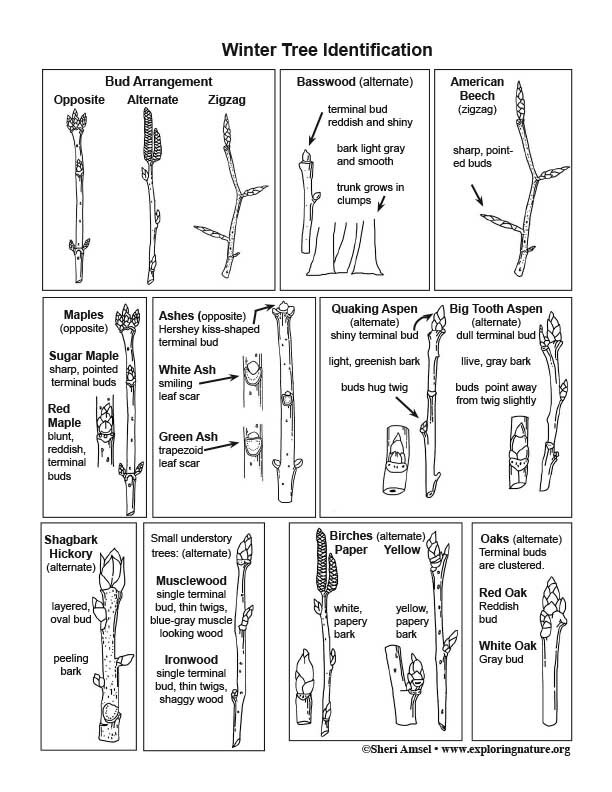 To learn more about some of the identifying bud characteristics of some common Michigan tree species, click here. Now that you are familiar with what the buds of some of Michigan’s common tree species look like, test your knowledge and go for a hike in the woods! Remember to consider “where” the tree grows as that can be quite helpful, especially for sites that are particularly dry or wet. Some species are intolerant of shade, saturation in the soil, etc. The more trees you know, the easier it is to learn more. One of the best field guides is “Trees of Michigan” by Linda Kershaw. Norman Smith’s “The Trees of Michigan and the Upper Great Lakes” is also a good field guide.